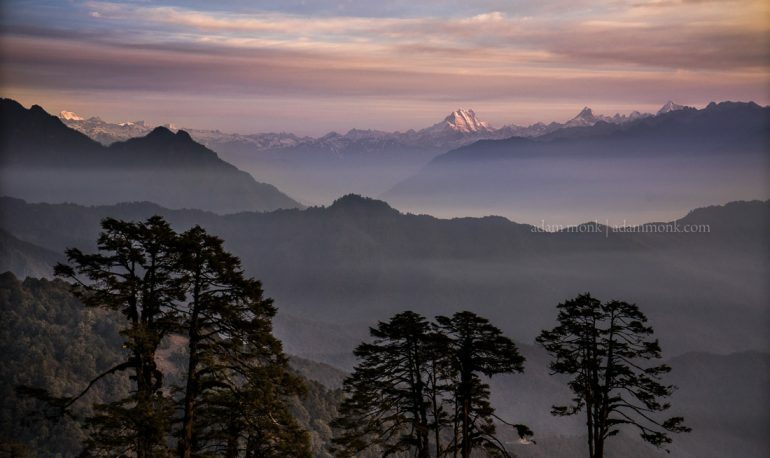 15 full days of experiencing and photographing the wonders of the isolated Himalayan Kingdom of Bhutan with the guidance of two highly experienced professional photographers. 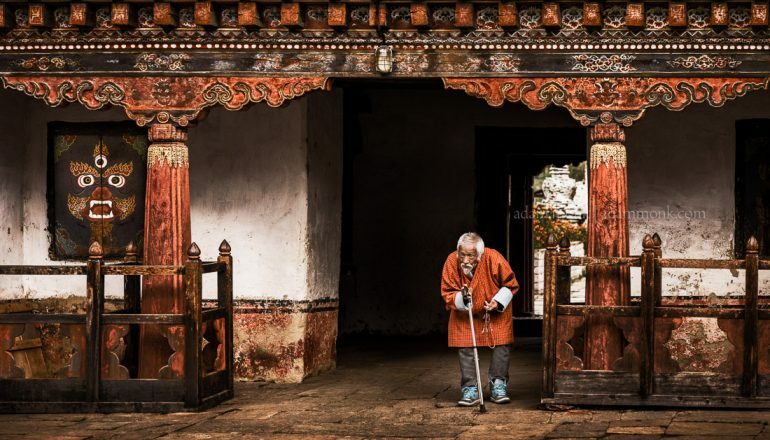 Closed to the world for many years, Bhutan is like stepping back in time to a slower more gentle time, a place where the pace of life is more sedate and the people seem to be always smiling. 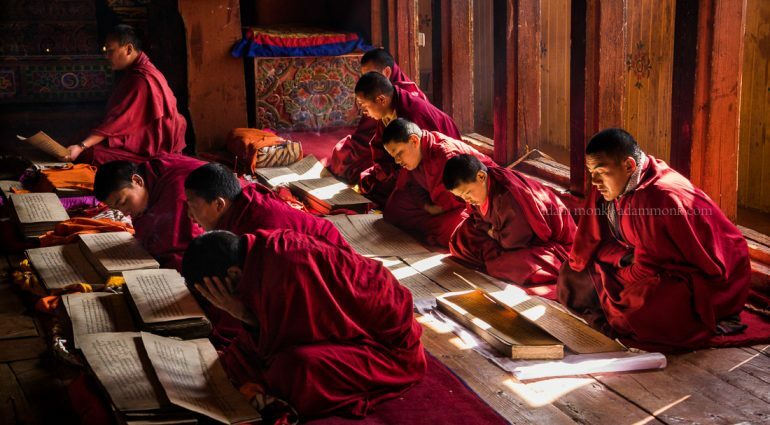 Join Adam Monk & Paul Hoelen for a 15 day full cultural immersion tour photographing the life, culture and landscape of Bhutan. 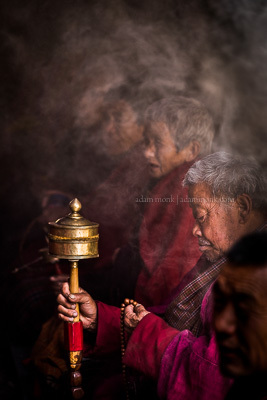 2019 Bhutan Photo Tour is booking now! Tour begins and ends in Bangkok. Small group size of just 12 People. Travel in cars not a bus, just 2 participants & 1 guide to a car. In Bhutan we fly one way, so only half the driving! Photo Tuition from 2 full time professional photographers. It’s quite a picture. Then somewhere a mobile phone rings. The Serene Monk stops his chanting, reaches into his volumous robe, pulls out his iPhone 7s and begins an animated conversation with someone on the other end of the line… Probably another serene Monk in another Ancient Temple atop a mountain across the mist shrouded valley. Bhutan 2018 – Two remote Cultural Festivals! 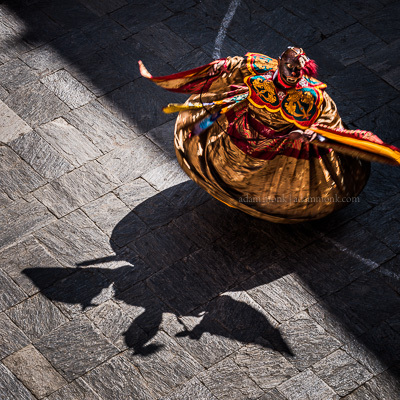 For my 2018 Photo tour to Bhutan I am excited to tell you we will be visiting two Bhutanese Cultural festivals I have wanted to see for years. 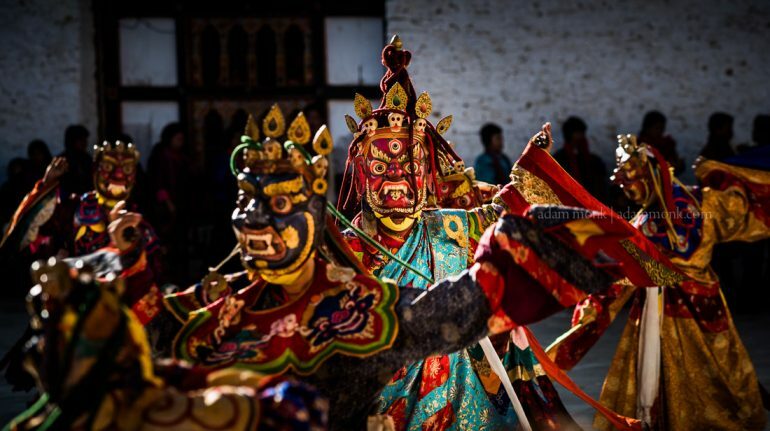 These two festivals are in two of the most visually stunning locations in Bhutan, places I have visited many times but never seen the festivals. 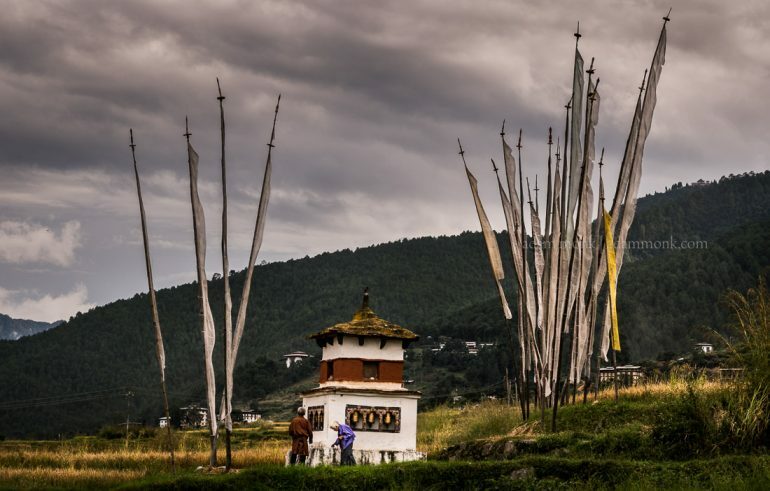 I have been saying to my guides since the first journey to Bhutan “I want to see the festivals here!” But the dates just refused to line up… Until now. We won’t be going to the easy touristy festivals like Paro or Thimphu, these festivals are intensely crowded and actually have more tourists than locals. Instead, after arrival in Paro we will be flying directly to Jakar in Central Bhutan where we will meet our Guides, Drivers and cars (not a bus!). We then travel overland along the stunning mountains and valleys of the Himalayas, through the gorgeous region of Bumthang (Land of Beautiful Ladies – According to one of my guides) and in to the steep and heavily wooded valley of Trongsa to our first festival, Trongsa Goenpoi Dromche. In this festival the Monks and the farmers do the dancing and the local people come from all the surrounding towns and villages dressed in their finest and most colourful traditional clothing for the festival days. It is an amazing sight to behold and we are here for two whole days, so you will have plenty of time to take it all in. Along the way we stop at many beautiful sites of both natural and cultural wonder, there will lots of time for some slow intimate photography with loads of interaction with the friendly locals. The group is kept small, so there is always time to work on your photography and get plenty of tuition and guidance, as well as learning from each other. By flying one way, when most tours drive out and back, we save many many hours of driving, which allows us to spend lots more time immersed in the locations and the culture. Having cars instead of a bus, and 1 guide and a driver for every two guests means we have a lot more freedom to explore different locations and a lot more flexibility. If you would like to read more about these details head to my Bhutan Question & Answer page. Itinerary: 15 day Bhutan Photography Tour 2018. Day 1 – Nov 4th 2018: Bangkok. We begin the tour in Bangkok, meeting the night before in our hotel to get to know each other a little before boarding our flight to Bhutan the following day. The nights accommodation in Bangkok, breakfast and the flights from Bangkok to Paro return, are all inclusive in the tour. Day 2: Arrival & Paro Valley. We leave Bangkok after an early breakfast in our hotel and the departure area is just a 5 minute bus ride from the hotel. The flight to Paro is just 4.5 hours, so we arrive just in time for lunch. At Paro airport we will be met by our chief guide and driver who will take us to a lovely spot for a cup of tea and a freshen up. After lunch we will spend the rest of the day leisurely exploring the beautiful Paro Valley. Day 3: Bumthang, Central Bhutan. Today the adventure really begins when we fly to Bumthang in Central Bhutan, where we will be met by our cars, drivers and the rest of our Guide team. The internal flight from Paro to Jakar in Central Bhutan takes us over the foothills and mountains of the Himalayas. If we have a clear day (which is usual at that time of year) we will have spectacular views of the countryside we will be seeing on our drive back. This short 45minute flight is a fabulous way of putting the incredible terrain we will be passing through into perspective. 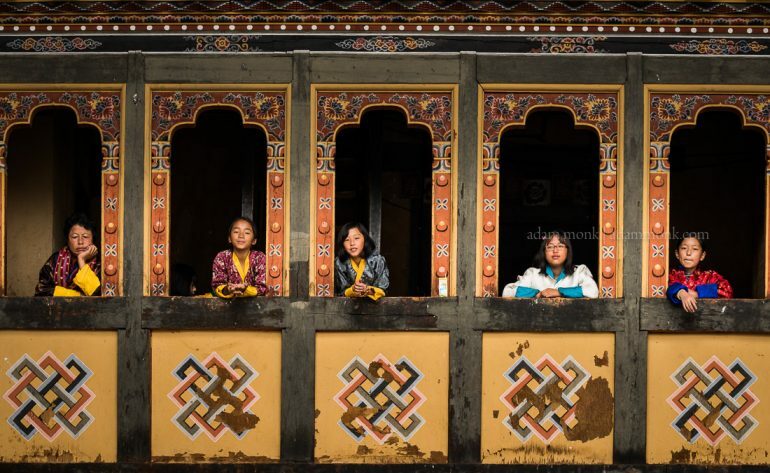 After landing in Jakar and getting settled into our Hotel we will spend a little time investigating the beautiful region of Bumthang around Jakar, in particular the lovely Jakar Dzong. This Dzong was built on a ridge overlooking the Chamkar valley in around 1549 on the site of an even more ancient temple. It is thought to be the biggest Dzong in Bhutan with a circumference of more than 1500 metres. We also have a spectacular sunset and sunrise viewpoint of this Dzong from the site of our hotel just across the valley. Day 4: Ura Valley Day Excursion. Today we have a day of peace and serene nature with a full day excursion to the fourth and most remote valley of the Bumthang region, the Ura Valley. Here we will leave the cars outside the valley and walk down the trail through beautiful autumn countryside and forested hills along the old walking trails that used to be the only link for these remote locations. We are walking downhill, so it’s not a strenuous walk, rather it is a chance to breath the fresh Himalayan air and listen to the sounds of birds, while photographing the beautiful views across the valley along the way. As we reach the bottom of the valley we walk into the outskirts of the traditional rural town of Ura. The walk ends at the beautiful Ura Lhakhang Temple, where our cars and drivers will be waiting for us with a picnic lunch. The Ura Valley is Bhutan at its most real, daily life as it has been going on for centuries, and a fabulous place to experience it. 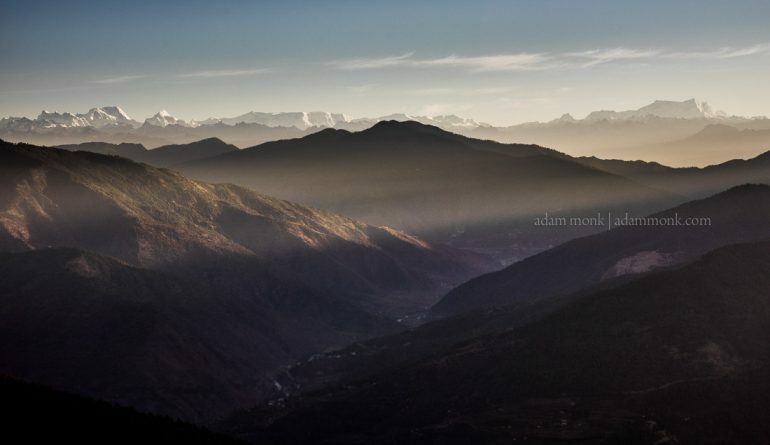 On the way back to Jakar there are many stunning viewing points for sunset on the Himalayas if we are blessed with good weather. Day 5-6: Bumthang to Trongsa Valley – Goenpoi Dromche Festival 2 days. From the Central Bhutan Region of Bumthang we begin our trek West across the Yutonla pass to the steep and heavily wooded valley of Trongsa. The Trongsa Dzong (temple fortress) is one of the most spectacularly sited Dzongs in Bhutan, perched on a sheer mountain commanding the valley in both directions. This is where we will be seeing our first cultural Festival, the Trongsa Goenpoi Dromche, which is a festival I have wanted to see for 7 years now. The Trongsa Dzong is the most spectacular Dzong that I have seen in Bhutan, and would have to be one of the best locations ever for seeing a festival. 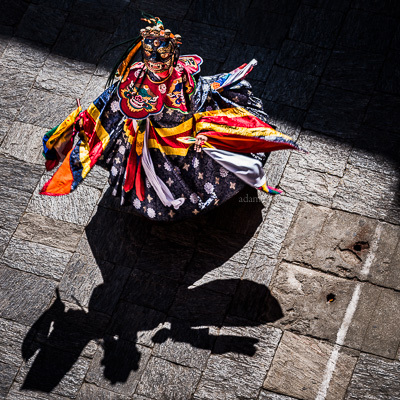 Stunning colourful costumes, wild dancing and lots of great shooting opportunities with loads of Bhutanese Monks in striking saffron robes. Trongsa Dzong was built in 1648 and has many levels cascading down the mountain on whose side it is precariously perched. It was once the primary seat of power over Central and Eastern Bhutan as the Dzong commands the only connecting trade route in both directions. Both the first and second Kings of Bhutan commanded the country from the ancient seat of Trongsa, and even today is customary for the Crown Prince to serve as the Trongsa Penlop (Governor) prior to ascending the Throne of Bhutan. We will be spending nearly 2 full days in the valley of Trongsa, exploring Trongsa dzong, the surrounding valley and the incredible Festival. Our hotel just a 30 minute scenic walk from the Festival, and there are lots of great spots for sunset shots down the Steep wooded valley on our way home in the evening. Day 7: Trongsa to Gangtey. 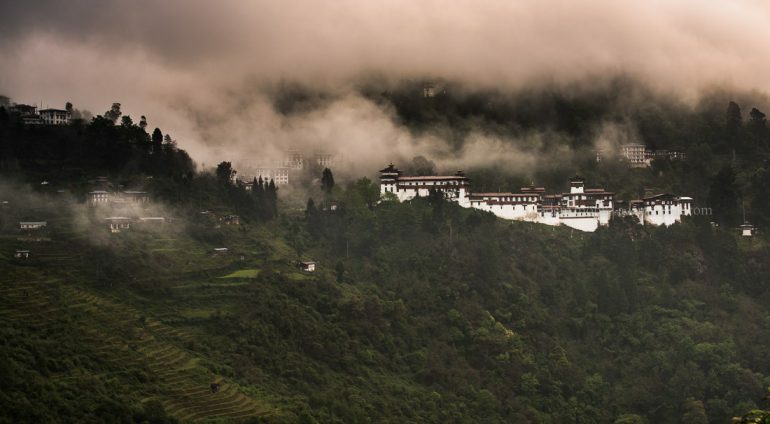 We will spend the morning beginning with a sunrise shoot from our hotel balcony of the stunning Trongsa Valley with the spectacular Trongsa Dzong clinging to the hillside, hopefully with a bit of mist forming in the valley. We are here for two nights, so we get two chances at this dawn shot. After Breakfast we will head back to the Trongsa Dzong for the mornings dancing at the festival, or for those who are “Festivaled out” exploring the town for some local portraits. All the locals will be in their finest clothing today, so the town will be a riot of colour and smiling faces. After lunch we are off again, heading through the Mangdi Valley, across Wangdue and the Sha Valley over the Pelela Pass at 3,400 metres in the direction of Punakha. Before reaching Punakha though we will be making a diversion, turning South and heading to the wide glacial valley of Phobjikha and the lovely town of Gangtey with its beautiful 17th Century Monastery and Temple. The Phobjikha Valley is unlike anywhere else we visit in Bhutan in that it was formed through glacial action and it is wide and open with gentle slopes and woodlands on both sides. The town of Gangtey is situated on a high promontory at one end of the valley and has wide sweeping views right down the valley on all 4 sides. Gangtey is a spectacular location for our second cultural festival, the Gangtey Black Necked Crane Festival, which is held in the Monastery each year, and begins the following day. Day 8 – Nov 11 2018: Phobjikha Valley & Gangtey Crane Festival. We spend the whole day today in Gangtey and the Phobjikha Valley. The Crane Festival is a very special festival that happens for just one day a year in the Gangtey Goemba. Gangtey is a particularly beautiful town in an almost unbelievably scenic location, so there will be loads of great viewpoints as the locals dress in their finest for the festivities and the Monks come into town from the communities all around. But there are many things to see in the Phobjikha Valley and we will divide our time between watching the dances and stories at the festival and walking in the beautiful landscape of the valley itself. The Phobjikha Valley is actually a sanctuary for the endangered Black Necked Cranes that migrate here each year, and by the time we get there we should see the first of them coming into their winter home. We also know a few of the locals quite well in Phobjikha, so it’s always nice to visit in the afternoon to experience village life first hand. Day 9-10: Gangtey to Punakha. Onwards to Punhaka and the Chimi Lhakhang, crossing the Pele-la pass at an altitude of 3,400 meters. The Chimi Lhakhang is the Temple of the Divine Madman. This Temple was built to honour the Lama Drukpa Kunley, whose outrageous and often sexual methods of sharing Buddhism are a legend all over Bhutan and thus he is known as the Divine Madman. We will end today with a sunset shoot of the spectacular Punhaka Dzong built at the confluence of the Mo-Chu and Po-Chu (Mother and Father Rivers). The following day we will spend exploring some of the many Temples, Monasteries and Palaces in the Punakha Region as well as the stunning Punhaka Dzong. The Punakha Dzong was built in 1637 to command the confluence of the Po Chhu and Mo Chhu Rivers (mother and father rivers). The full title of the Punakha Dzong is Druk Pungthang Dechen Phodrang, which means the Palace of Great Happiness. In the past it has been the seat of Bhutan’s Government and is now the home Je Khempo the head of the Buddhist Monk body of Bhutan and more than 1000 Monks. 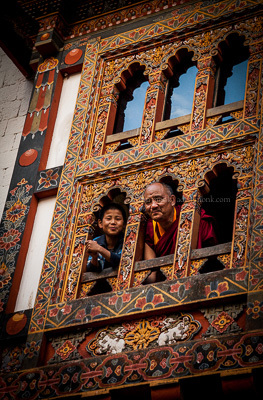 The Punakha Dzong has many levels and corridors to explore as well as two stunning Temples. There are many great viewpoints of spectacular architecture of stark white walls contrasted beautifully with the deep red robes of the Monks as they go about their daily rituals. The Punakha Dzong also makes for a spectacular sunset and twilight shot. Day 11: Punakha to Thimphu. After Breakfast in Punakha we will head in the direction of Thimphu, the capital city of Bhutan. On the way there we will stop for a shot at the Dochula Pass, where, weather permitting, we will be blessed with a spectacular view of the Himalayas stretching away into the mist before heading into the city of Thimpu. 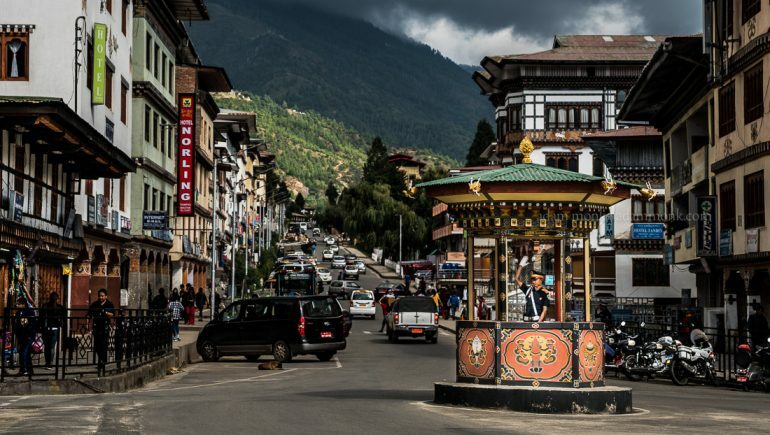 Thimpu is not what you expect from a capital city, it is set in a lovely rural valley with beautiful natural scenery on all sides and buildings built in the traditional Bhutanese style, but still with all the modern conveniences of a large town. A few years ago the local authorities installed a set of traffic lights at one of the main intersections in Thimpu, but there was such a large outcry about it that it was swiftly removed and the small police box (with policeman inside) was reinstalled into the centre of the intersection, where you will still find him today directing traffic with an intricate ballet of hand signals. Day 12: Exploring the Thimphu Valley. Thimphu is the bustling city of Bhutan, but it is really just a big town filled with an amazing mix of the old and the new side by side. The ancient culture of Bhutan is alive and well in Thimphu, and we have many options of things to see an photograph here, including the lovely old Monastery and temples of Tango or Chari just a short drive out of town. It’s about 1.5 hours walk up the hill through the Pine trees to reach the historic 13th century Tango or Chari Monastery and Buddhist Collage. Here we can spend all morning exploring and photographing the temples and Monks, before a picnic lunch at the edge of the forest and a sunset shoot of the magical Thimphu Valley with the incredible Thimphu Dzong as foreground. Day 13: Thimphu to Haa Valley. Today we begin a slow drive through the lovely Thimphu valley on roads that wind around the mountains overlooking the lush forested valleys with rushing white water rivers. You will see the landscape change as we ascend from the Thimphu Valley up into the Haa district of Bhutan with its stunning open series of valleys situated between the town of Paro and the Capital of Thimphu, adjacent to the Chinese border. The whole region was closed to tourism until very recently due to its very sensitive proximity to China, and in fact there is only one small, beautiful hotel. The Haa Valley itself is a stunning steep sided valley running North to South, with many spectacular views of the surrounding mountains and countryside filled with forests, farm land and rice paddies clinging to sides of the mountains. We spend the whole day here exploring the valley and the sights that Haa has to offer, as well as a taste of the wonderful regional food of Haa. Day 14: Haa Valley to Paro. Today we take a slow meandering path out of the Haa valley in the direction of Paro. Weather permitting we will do lots of walking on the quiet winding roads that pass the cultivated fields and farm houses of Haa. 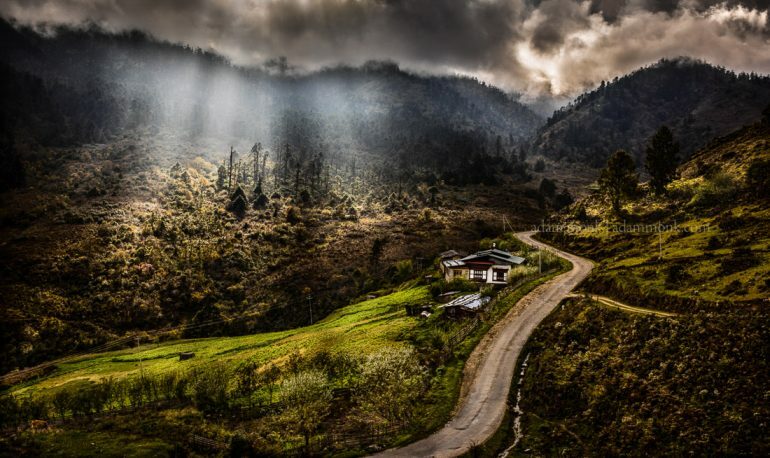 It’s a place of small quiet villages of simple subsistance farming and gentle peaceful life, all with the backdrop of the spectacular steep sided valley and the Himalayan mountains! We end the day back where we began the journey 15 days ago in the lovely valley town of Paro. We have saved one of the best until last… the hike to the Taktsang Monastery and the Tigers Nest. It is quite a long hike up, especially if you are stopping every 5 minutes to make photographs, which you will be. It is an amazing place built right on the edge of the cliff and every step of the walk up through the conifer forest is beautiful, take lots of memory cards! You do have the option of a horse trip up to the Cafe at the half way point, but I think the walk is just too good to miss. Our wonderful guides and drivers will bring a picnic lunch up for us to a great spot on the side of the mountain, there is even hot tea. The afternoon is free to have a hot stone bath at our Hotel, or wander a bit more around Paro town. For those who have been missing their coffee, Paro also has the best coffee since Thimphu, and a great atmospheric little cafe to enjoy it in. This evening will be our last together, and the time to really say goodbye to our guides and hosts for this amazing adventure. We end the evening with a hot rum punch, a speciality of the Hotel barman, and a slideshow of memories. Day 16 – Nov 19th 2018: Breakfast and Departure. Our last breakfast together, then pack and off to the Paro airport for final goodbyes for our flight to Bangkok. Prepare to shed a tear or two here where you will say goodbye to our guides & Drivers, our constant companions and friends from the last two weeks. Don’t be surprised if you find yourself back in Bhutan in the very near future! ** The tour price is based on a single traveller with private rooms all the way. If you are a couple or travelling with a friend (twin share room) you will receive a discount. Please notify us when booking. Flights from Bangkok to Bhutan and return to Bangkok. Scenic domestic flight from Paro to Bumthang. 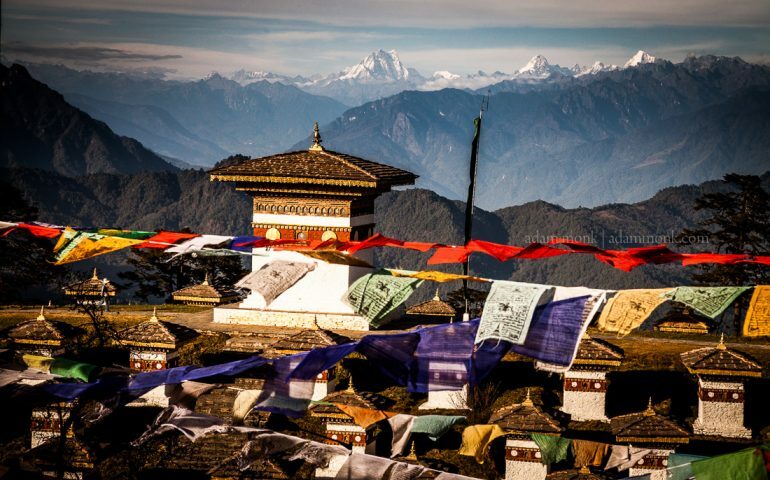 Full 15 days in Bhutan with all land content included. All photographic tuition and workshops for the duration of the tour. Two professional photographers to help you get the best photos. Fully functional Lightroom catalogue with Bhutan Keywords & Smart Collections pre-loaded. Evening meal in Bangkok (night before we leave for Bhutan). 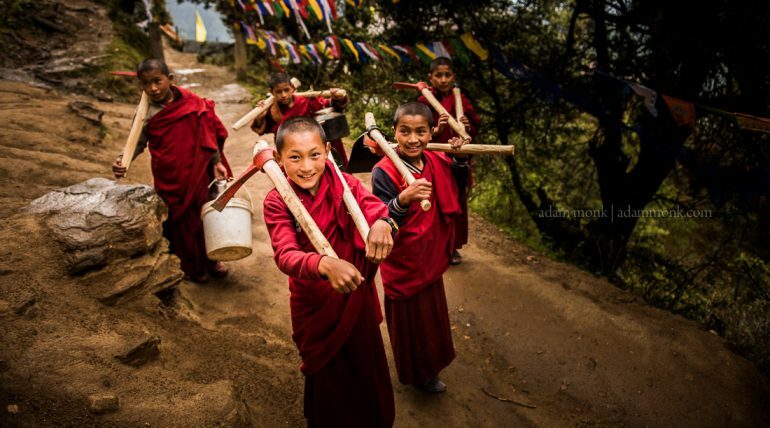 Tips for Bhutanese guides and staff along the way. Adam is an award winning landscape and travel photographer with a longstanding passion for the natural environment. He has been travelling and photographing the worlds wild places for over 25 years and the enthusiasm just continues to grow. Adam has been based out of his own landscape photography gallery in the port city of Fremantle Western Australia for the last 13 years and his images can be found in numerous private and corporate collections all over the world. 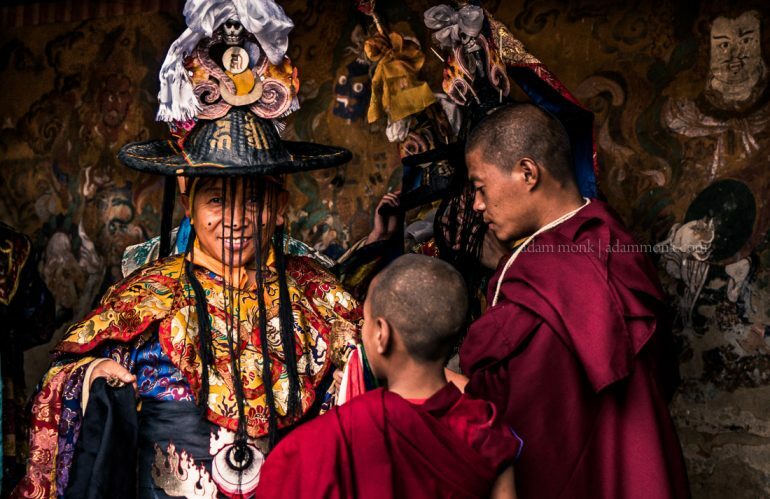 For the last 10 years Adam has been organising and running photography workshops and photography tours to some of the worlds wild and beautiful places such as The Kimberley, Cambodia, Iceland, Greenland and of course Bhutan, where he has been visiting regularly since 2011. This trip in 2018 will be Adam’s 8th photo tour to Bhutan, it’s a place he never gets tired of and the anticipation before each tour is just like the first time. Originally born in New Zealand to a Dutch Sailor and an American Nun, Paul has managed to put his four passports to excellent use before eventually settling on the beautiful, wild island of Tasmania. 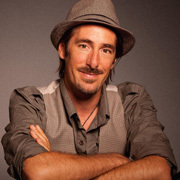 Paul is a Master of Photography in the AIPP and Fellow of the NZIPP, he has won many awards and judges regularly at a state, national and international level, runs photo workshops worldwide and writes for numerous magazines. 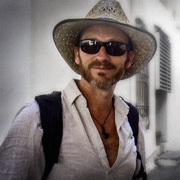 Self taught, travel hungry and with a healthy thirst for adventure he thrives on the challenge and freshness of shooting a wide diversity of genres ranging from fine art nudes, landscapes, and large-scale event photography through to fashion, travel, documentary and environmental portraiture – though he’s most renowned for his exquisite landscape imagery.